Life is simple when organized and there is a universe of organizer software that can help you reclaim your organizational mojo. When you can’t make out the notes you scribbled at the back of a newspaper and you haven’t turned a page of your calendar since 2013, you know it’s time to get organized with digital tools. Luckily, with the advent of personal organizational tools, mind-mapping, and digital note taking apps, organizing your life with digital tools become a breeze. Information organizer software organizes your life by creating daily to-do lists, keeping reminders, taking notes, and enabling you to achieve life goals. It serves as a planner, an address book, and a notebook all in one. The best information organizer tools even goes an extra mile by providing extra tools to back up data, set up budgets, provide driving directions etc. Most of these tools can be used on the desktop as well as in mobile devices. With the help of these tools, you can be more productive and get the job done with ease. 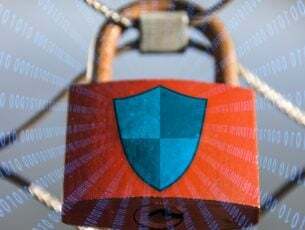 Efficcess is a secure information organizer software that works across PCs and desktops making it one of the most versatile personal information manager. With a built-in journal, password manager, task list, address book, calendar, and an automatic backup, you would not want a better organizer software than this. You can create custom reminders so you don’t miss important events. The calendar is equipped with drag and drop features so you can easily reschedule an appointment as well as add major holidays to your personal organizer. Efficcess come with a built-in recycle bin to safeguard you against permanently deleting important information erroneously. C-Organizer is another powerful organizer tool that comes with extensive synchronization capabilities that allow users to access data from almost any device. With Word Processor, password manager, address book, to-do list, and calendar, C-Organizer packs all you need to organize your personal and professional life. This personal organizer software protects your private data by password and encryption to prevent unauthorized access. You can sync your data with Google or upload it to cloud via Dropbox or Google Drive. C-Organizer also lets you export data as HTML, XML, CSV,and TXT so you can easily import your software data to another application. 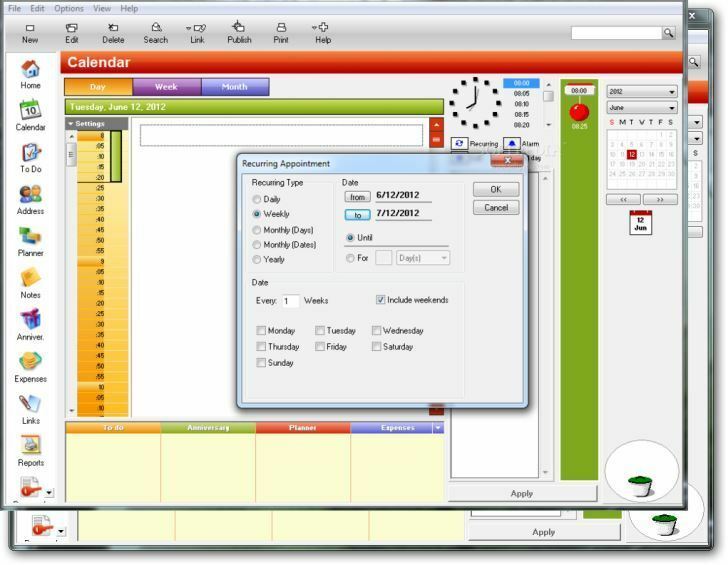 AnyTime Organizer Deluxe is one of the most reputable personal organizer software and packs more than you would expect to find in an organizer software. Its ability to expense reports, show driving directions and connect to Google makes it a must have tool for business professionals. AnyTime Organizer is bundled with a myriad of tools to enhance your personal and professional lives. 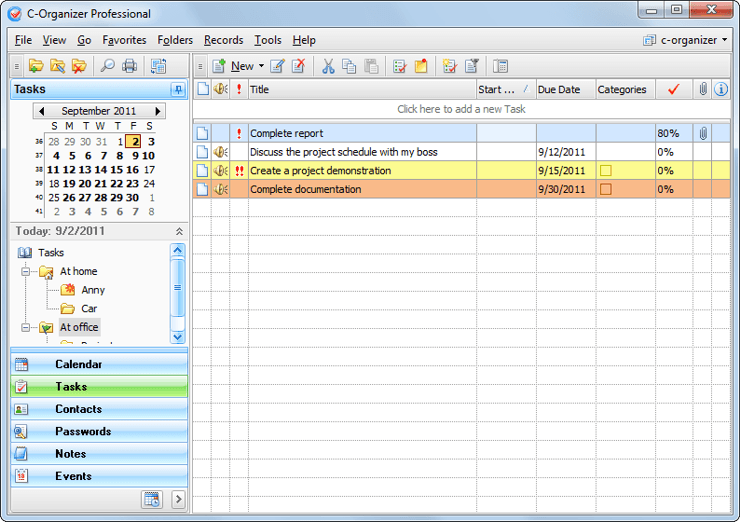 Any undone task is automatically moved to the next day and you can use the calendar to keep track of important events. You can set up reminders and the software will audibly remind you when it’s time to complete a task. You can even set the system to send a text message or email when it’s time to complete a task. Since the tool can connect to Google, you can download NFL, NASCAR, PGA, MLB, NHL, and NBA season schedules and pin them to your daily planner. In addition to your calendar events, you can use the tool to manage your expenses and perform other activities like import data from Microsoft Outlook. When looking for a perfect virtual personal assistant, you need to speak to it directly without having to type anything. Speaktoit is pretty much Cortana after she has been promoted. The tool lets you search the web, make calls, send texts, remind you of tasks while remembering everything on your to-do lists. The app can be anything you want it to be, be it personal assistant, an old professor or even a brunette. The app will perform all tasks, answer your questions and even give you social network updates. All you have to do is give commands and Speaktoit will follow instructions like a dutiful son. The app is available for Windows, Android, and iOS. As the name suggests, Remember the Milk is an intelligent personal organizer software that works like a second brain to the forgetful folks. This software auto-generates reminders so you will never forget to perform an important task or attend an important event. The opening screen lists all the important to do tasks in a very informative way. ‘This evening, it’s your turn to pick the kids from school’, ‘Remember to pick your Jacket at the dry cleaners on Thursday after 3.00pm’. Your boss, secretary or business partner can send task requests directly to your RTM inbox so you can incorporate them in your daily planner. 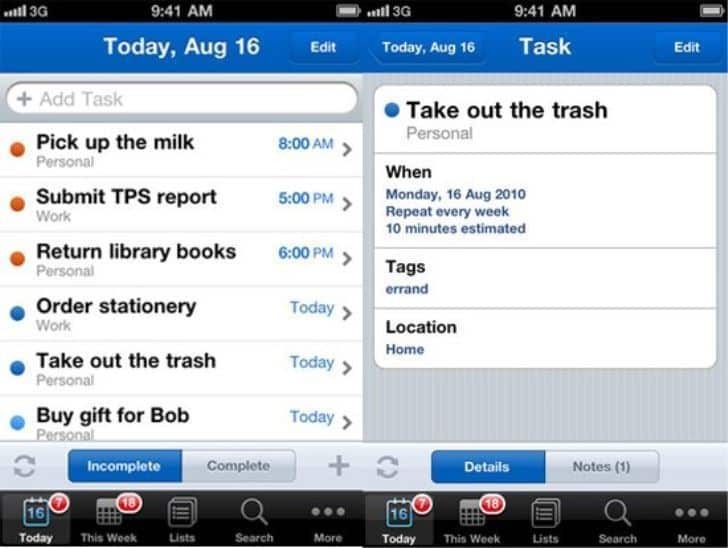 Sandy is a time cautious organizer software that acts like a real personal assistant. Its dynamics are totally different from all the other personal organizer software. This is how it works. Sandy communicates with you daily via email and text messages. You send Sandy an email that looks like this: “Reminder: Attending meeting on Friday at 2.00pm”. Sandy will fire up a reminder in a noble manner as if she were flesh and blood. Sandy can also tag, store, and recall important bits of information which you might have forgotten or trashed. MSD Organizer is a handy tool that packs a load of attractive features. It organizes your personal and professional information as well as music, labels, and cards. Among the many features, you will find the calendar, to do lists, address book, task manager, journal, and a notes section. The calendar has the drag and drop functionalities that simplify the process of removing and adding tasks. Not only does the address book provides the name, number, address, email, and picture, but also allows you to download and attach documents, reports, spreadsheets, and notes. Other organizer tools included are property organizer, music, health records, and budget templates. 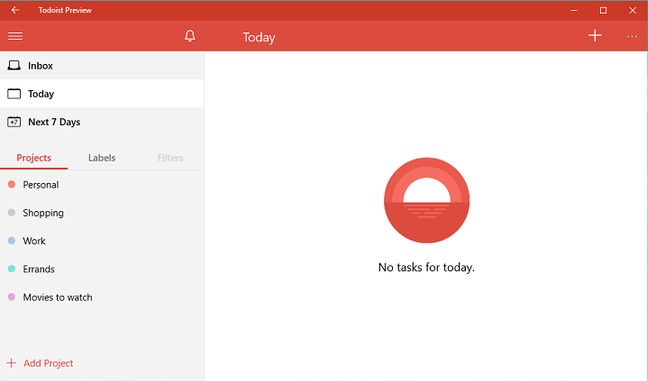 If you are looking for a personal organizer software that works on all devices, then you might want to try out Todoist. With an easy to use interface and numerous collaboration tools, Todoist is one of the most feature-rich task management apps on the market. One thing you’ll notice once you open a Todoist account is that you have tasks, labels, filters, weekly overview, and projects due today. The filter tool is very valuable to those who juggle multiple tasks at a time. Todoist also has a reminder system but it’s only for premium users meaning you have to pay. Though My Ultimate Organizer can only be accessed on desktop, it has an assortment of features that gives it an edge against the competition. It comes with a simple and easy to use interface that resembles that one of Microsoft Outlook. You will find the common organizer tools such as address book, task manager, journal, tasks list and a planner. You can use the custom reminders to remind you of important dates and events. In addition to the organizer features, the tool has built-in expense reports that can help you to track expenses and budget. It also has a password manager that can help you track all your passwords and logins. It also comes with several options for importing files including HTML, CSV, and TXT. 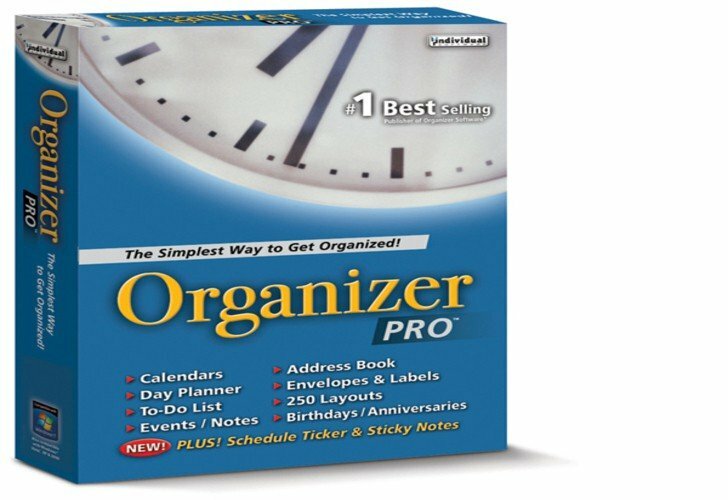 Organizer Pro comes with the same top-notch features as AnyTime Organizer Deluxe only that it lacks the extensive synchronization abilities. 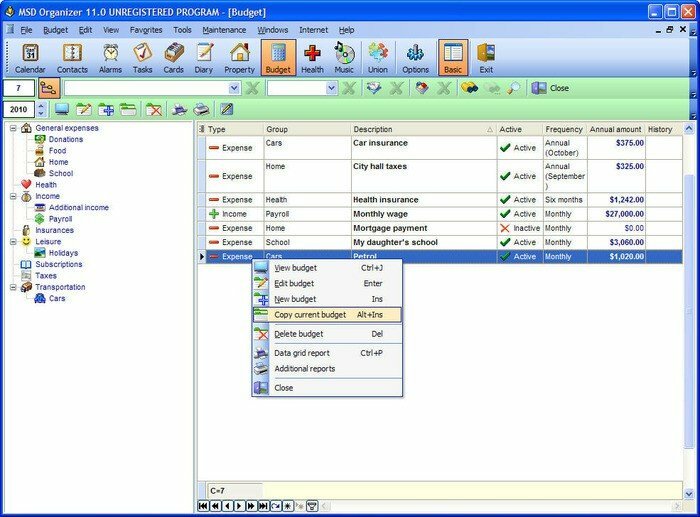 The interface is user-friendly with all the organizing tools nested on the left panel of the program. It comes with various organizing features including a feature-rich calendar and to-do lists. You can add priority levels to the tasks so as to major on the most important tasks first. There is a personal information manager feature that can be used as a journal or a notebook. You will also be able to do budgeting using the provided budget template as well as track and organize your finances. While organizing features and the cost of the program are the key considerations in choosing the best organizer software, you should also pay close attention to the program’s syncing capabilities. 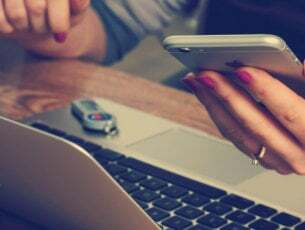 When a program is compatible with mobile devices and tablets, it becomes more versatile since you can access all your to-do lists and other important information on the go. Some of the programs discussed above like the C-Organizer and others do have extensive syncing abilities. We hope that you will find this information useful. Feel free to comment and share.